Well, not exactly. But it sure got your attention, didn't it? 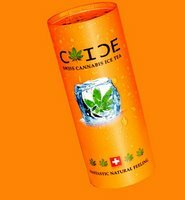 TGS has been getting a lot of new visitors lately who want to know more about C-Ice Swiss Cannabis Ice Tea. I wrote about it in May, but now it's in the news due to the fact that it's being released in Britain. Fans of this whole cannabis/marijuana thing probably shouldn't get too worked up about this one. If I've got my information straight, it appears that you're likely to get more of an "effect" from the black tea component in the product than you will from the hemp-related ingredients. Here's the link to the brief article I wrote in May. Here's a recent report from the British press. Here's a link to the company's Web site.